After being on the market for over two years, Brooklyn’s priciest townhouse–a $40 million home at 3 Pierrepont Place–is now being offered as four rental units. 6sqft previously featured the home, known as the Low Mansion for the previous owner and businessman A.A. Low, whose son, Seth Low, became mayor of New York City in 1902. Spanning 17,500 square feet, the eight-figure townhouse boasted 15 bedrooms, 16 bathrooms, and more than 9,000 square feet of garden and outdoor space with original details galore. 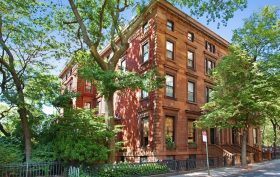 Though even Matt Damon toured the grand Brooklyn Heights property back in September, the house hasn’t found a buyer, so the owner is now offering the mansion as four luxurious rental homes from a $4,500 one-bedroom to a 1,700-square-foot top-floor unit for $12,000 a month (h/t Curbed).